In this occasional feature, we shine a spotlight on someone in the arts and culture world. Actor Chiara Motley talks about the quick costume changes required in tackling the role that won Gwyneth Paltrow an Oscar in the 1998 movie, and how Lee Hall's stage adaptation is different from the film. Gwyneth Paltrow didn’t have to do them quite so swiftly in the film version of “Shakespeare in Love.” But Chiara (pronounced Kee-ara) Motley has to make near-instant costume changes, character transformations and gender switches, playing the same double role in Seattle Shakespeare Company’s theatrical version of the popular 1998 movie that won Paltrow an Oscar. Like Paltrow, Motley portrays both the patrician lady Viola de Lesseps and (to win a role in “Romeo and Juliet” at a time when women were barred by law from acting) also her stage-struck male alter-ego Thomas Kent. As for the Shakespearean aspect of this fictional romance about an ardent young Will of Avon falling for the fetching Viola/Thomas, Motley has it nailed. 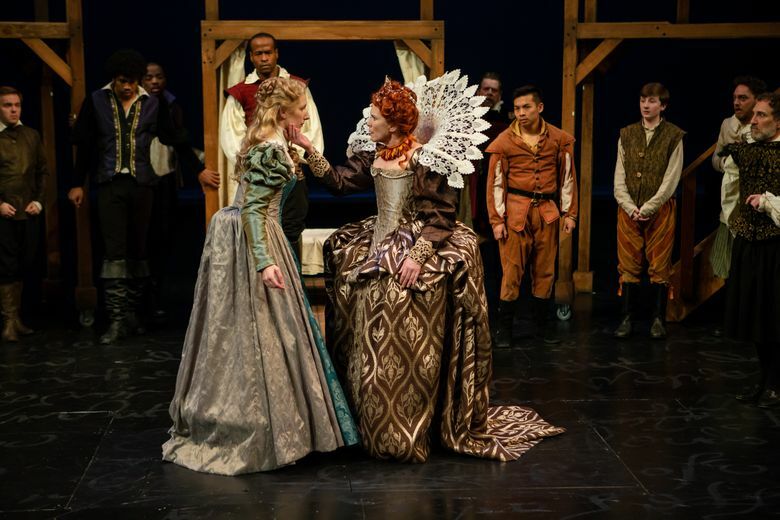 Now based in New York, but a fond fan and former resident of Seattle, she has performed in the Bard’s plays for Seattle Shakespeare (including “A Midsummer Night’s Dream,” “Richard III” and “Othello”) and other regional theaters. And her classical acting chops also came in handy when she appeared on tour (at Seattle Repertory Theatre and around the country) as the Ghost of Princess Diana in “King Charles III,” Mike Bartlett’s speculative drama in which Britain’s current royal family speaks in Elizabethan-style verse. 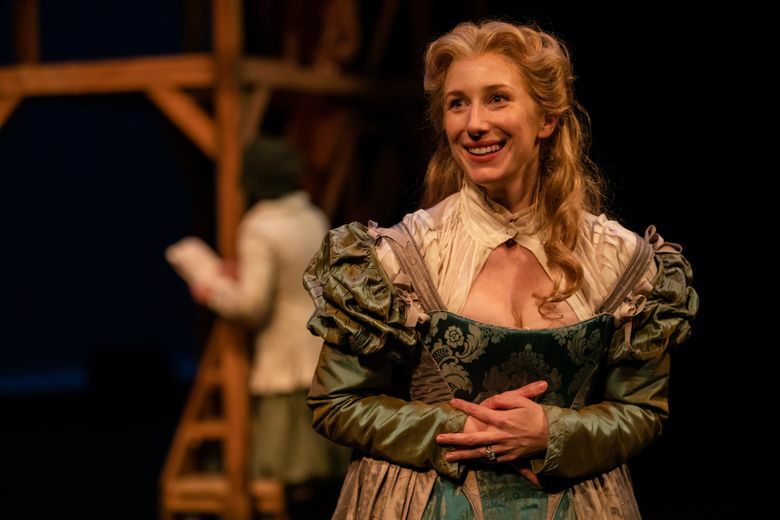 The genial, animated performer chatted recently with The Seattle Times about the challenges of being in “Shakespeare in Love” (the most-produced new play in the U.S. last year), and her attachment to Seattle. So in this production you’ve got to be a woman, and a man pretending to be a woman, with dashes of Romeo and Juliet mixed in. And in the midst of all this there’s a love triangle between you, Shakespeare and Lord Wessex. Is it tricky to keep it all together? It gets complicated! I think of it as technically I play Viola, who disguises herself as Thomas Kent, who is hired to play Romeo. It’s all those things rolled into one. At the beginning Viola is young and dreamy, and by the end she’s fallen in love, lost her love, and then she’s going to America with her husband. It’s an epic journey. Shakespeare inserted “pants roles” in his comedies, where a woman wears male drag to pass herself off as a boy. Have you played one of those parts before? No! I’ve been in countless auditions for another Viola [who disguises herself as boy] in “Twelfth Night.” But the funniest thing is that I’m 5-foot-10 so I never got to do Juliet unlike a good friend of mine, who is the quintessential, petite Juliet. I was 5-foot-3 at age 13, and was immediately playing older women like Juliet’s nurse. But in this play I get to do little pieces of Juliet’s part which is really fun. What do you do to appear boyish as Kent? As a woman I’m in a corset and like 16 layers of clothes. As Kent I’m in breeches and a little jacket. That already changes my ability to move physically, and freely. And I have a lovely pixie wig, I have a pretty good mustache. But I don’t do super macho voice, because Viola is pretending to be a fresh-faced kid. Many people know and love the movie, which won seven Oscars — including best picture and best screenplay by Marc Norman and famed playwright Tom Stoppard. Are there big differences between the film script, and Lee Hall’s stage adaptation? The play is funnier than the movie! We are asked to do things that are completely stretching the limits of theater. I have four 30-to-50-second costume changes. I change every other scene! In the top of act 2, I do a quick change onstage with only Shakespeare helping me. And we do a lot of crazy feats and stunts, like climbing things. I wished the script was more gentle on the actors, but when you pull it off I think it’s more fun for the audience. You’re watching performers on a crazy, crazy sprint. Rehearsing and performing here is kind of a homecoming for you. What was your time living in Seattle like? I was graduating from Stanford University and I had a professor who said her friend, Jane Jones, ran this company here called Book-It Repertory Theatre. I had been to Seattle once, as a child. It was a complete unknown, but I just came. I spent a season [2007-2008] with Book-It as an intern, and I got lucky and was cast as the lead in Jane Austen’s “Persuasion” for them. Then I met [Seattle Shakespeare Company and Wooden O artistic director] George Mount, and though I went on to grad school in Denver I kept coming back to Seattle in the summers to do outdoor Shakespeare. I just fell very deeply in love with it all, the theater community and the city itself. And I met my husband Brian Claudio Smith here, so it was definitely a home. Your husband, who also has numerous Seattle stage credits, is in the cast of “Shakespeare in Love,” too. But he doesn’t play your love interest, right? A dear friend of mine, Rafael Jordan, is playing Shakespeare, and Brian is playing Wessex, the man I don’t love but have to marry. But that’s actually more fun. I’m in love with Brian already!